"I always knew one day she'd come home." 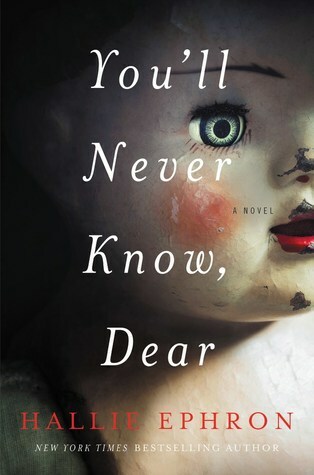 You'll Never Know, Dear sees three generations of women dealing with a haunting past. Forty years ago, young Lissie was playing in the yard with her sister Janey. The two girls occupied themselves with handmade dolls that their mother modeled after their likeness. Lis became distracted by a dog and left her sister to play alone. That was the last time anyone ever saw little Janey. Fast forward to present day. Miss Sorrel, the girls' mother, never recovered from Janey's disappearance. Clouded in grief, she gave up on creating porcelain dolls with her friend Evelyn, but she never gave up hope that she would see her daughter again. Each year, Miss Sorrel posts an add in the paper searching for the doll that disappeared with Janey. Each year, the ad goes unanswered. But this year is different. This year, the doll has come home. Vanessa is in the midst of deep sleep when she's suddenly awakened. For years, she has studied the way people dream. She seeks a way to control actions in dreams and help people who suffer from nightmares and PTSD. She is awakened with the news of a terrible accident involving her mother and grandmother, Lis and Miss Sorrel. An explosion in Sorrel's kiln, a tool that sat mostly unused, sent the two women to the hospital and caused considerable damage to Miss Sorrel's treasured doll collection. When Vanessa arrives at her grandmother's home, she learns that Janey's long lost doll recently resurfaced. The very next day, the explosion happened. Could the doll really belong to Janey? After all these years, why did it surface now? One glance at the haunting cover of this novel was all it took to capture my attention. From the very start, You'll Never Know, Dear, captured my attention and held on to the very end. There is a timelessness to Ephron's writing that makes for an almost enchanting read. While seasoned mystery readers will probably see the ending coming, it is the nuanced characters and vivid setting that make this a worthy read. With an unsolved mystery, strong female characters, and a few creepy dolls thrown in for good measure, You'll Never Know, Dear is everything I needed in a summer read. The book is marketed as "women's fiction", but make no mistake, this suspenseful novel will have men and women reading with fervor into all hours of the night. This entry was posted on Wednesday, June 14, 2017 and is filed under Book Review,Fiction,Hallie Ephron,Mystery,You'll Never Know Dear. You can follow any responses to this entry through the RSS 2.0. You can leave a response. Wow... this one sounds a bit creepy and dark, but also dealing with the very real issue of children going missing. I've only read one other novel about a character who went missing as a child. I am glad this one was so good for you this summer. I love that the creepiness was pretty subtle.